Sound decisions can only be made from good information. Yet, each year $239B is invested --and critical policy decisions made-- in agriculture in low and middle-income countries without good and recent data. The data gaps in agriculture are widespread, affecting 800 million, or 78% of the world’s poorest. We will not achieve SDG2 ―end hunger, achieve food security and improved nutrition, and promote sustainable agriculture― or measure its progress without good ag data. Investment costs are low, and the potential return on investment is high. A relatively small investment of less than $1 million a year in a country over a 10-year period can achieve far greater benefits in agricultural growth. 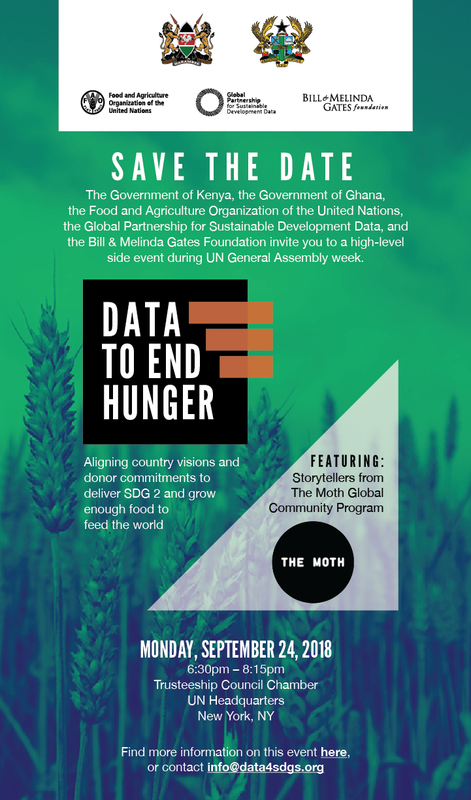 The event will demonstrate concrete donor policy and funding commitment by announcing significant investments to ‘close the agricultural data gap.’ The event will highlight commitments, related directly to analytical outputs of the End Hunger Sustainably project – on consensus and costing – and a concrete deliverable on scaling up support for in-country agricultural statistics.